more Instagram-worthy. That's never a good idea though! I am sure that you will agree with me that the vada pav today is the most famous street food dish of Mumbai. That's a no brainer. However, we have an unsung hero here which I predict will soon claim its place in the sun. I am talking of the toast sandwich sold across the street corners of Mumbai. I first had the toast sandwich in Mumbai when I came here as an MBA student to give placement brochures to companies here. This was at a stand outside the Eros cinema at Churchgate. I remember falling in love with it that day and have been smitten by it since, well after having moved into the city and after having lived here for twenty years by now. As a concept, this handheld toaster toasted sandwich was not unfamiliar to me even then. My granny used to make it for me in Kolkata when I would visit her as a chubby 8 year old during weekends to stay at their place. She had got the toaster with her from Delhi after my grandpa had retired and after they moved into to Kolkata. Granny's toast sandwich usually had mashed potato in it. I guess it was the cousin of what they call 'masala sandwich' in Mumbai where a turmeric and chilli powder infused mashed potato mix is added to the sandwich. The toast sandwich of Mumbai in its most basic form has in it vegetables such as sliced boiled potato (not masala mash) and uncooked sliced onion, tomato, cucumber, capsicum (green bell pepper) and beetroot rings. The inner surface of the bread in the sandwich is smeared with a green chutney made with ground green chillies, coriander leaves, salt, sugar, water, lime juice and occasionally ground coconut. Added to that is a liberal dose of butter and some chaat masala and salt. Butter is smeared on the outer surface of the slice of bread too to add crunch when toasted and to make sure that it doesn’t stick to the toaster. If you are feeling rich, you ask for a slice of cheese inside too. The sandwich is then put in the hand-held toaster and toasted. When done, it is cut into nine cubes for the ease of eating and smeared with tomato ketchup, green chutney and more butter on top. There is a secret sauce that often makes up the tomato ketchup and if you read this post till then end then you will find out what it is. It was the goodness of this indulgent mix of carbs, with the bite of vegetables and the toasted crunch of buttered bread and contrasting flavours of salt, butter, chilli heat and the sweet and tangy jugalbandi of the ketchup that did it for me. I was hypnotised by the sandwich I tried that blessed afternoon in 1996 and as I said earlier, it has held me in its spell since then. I do not think that I would have splurged then on a piece of cheese though and even now rarely add it to my order. I have often introduced the Mumbai toast sandwich to westerners who came to Mumbai and who join me on my Finely Chopped Food Walks and they all say that they loved it. They say that the sandwich reminds them of home and was yet so uniquely different. So Mumbai. So reassuring a welcome when in a foreign land, they said! It is the most hygienic of street food dishes too I feel as the sandwich is toasted in front of you and that should hopefully knock out most germs. There's an un-toasted version of the Mumbai sandwich too and there are variations to what goes into the core sandwich as well. You can knock out anything that you do not want. During our dating days, K and I were fond of cheese chili toast. This had potato slices, cheese, capsicum and the green chutney only. Now, if you remember, I started this post by saying that the fortunes of the toast sandwich is changing. Well, here is why I say so. I have noticed an interesting phenomenon of late. The fact that many Mumbai themed restaurants, whether in Mumbai, or outside of the city and in India or located abroad, offer a version of the Mumbai toast sandwich on their menu. 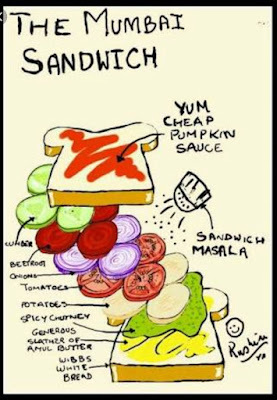 Many Indian cook book authors or food bloggers based abroad offer a recipe for the Mumbai toast sandwich in their repertoire. Hence, while, we have all been focused on the vada pav, I feel that the Mumbai toast sandwich could be the sleeper hit from the streets of Mumbai. I had a toast sandwich last evening at Bandra's Linking Road and that's when something struck me. I realised that you cannot replicate a Mumbai toast sandwich anywhere else, especially outside of India. No, I am not talking of just authenticity here. The cook's skill comes in to the making of the chutney and the chaat masala at the most. The latter is often store bought. As far as the chutney is concerned, while the core ingredients are common, I am sure that everyone will have their own proportions of the ingredients used and this could vary from street-side stall to stall and from grandma to grandma. I have a feeling that lying in the heat all day might have an impact on the taste of the chutney too as the day progresses. Let's not forget the flavour of the heat and dust of the streets of Mumbai that seasons these sandwiches as well. What I am referring to though is the role certain ingredients or components, which are intrinsically local, play in making the Mumbai toast sandwich what it is. Take the bread for example. The bread used is mass, commercially produced bread. White, soft, made with refined flour, lots of preservatives and gluten. Everything that bread connoisseurs scorn at. Popular local brands are Wibbs, Bimbo and Modern and Britannia. I have seen some stall owners use 'brown bread' too as Mumbai is the city that puts trends on a pedestal. Bread mavens would tell you that this bread is just coloured brown and is not actually made with wholewheat! The moment you use sourdough, wholewheat breads, baguettes, brioches or bread lovingly baked at home with the best of ingredients, you have moved away from the integrity of the Mumbai sandwich. It's like the pav in vada pav. It's just not a vada pav if you do not use a Mumbai ladi pav! I can't stress the importance of the handheld toaster too in making the Mumbai sandwich what it is. The famous Jai Sandwich opposite Bandra's National College uses electric grills these days as do other semi-permanent shops which are different from the street-side guys. The bread slices used here are bigger. The filling is more, especially the cheese. The cost too. I find these sandwiches to be over-engineered and not to be a substitute to the simplicity of my little darling from the streets of Mumbai. Within hand held toasters too, the results are different when using the coal fired portable stores of yore versus the modern electric stove. The sandwich guy at Linking Road uses an electric one. The toast happens faster this way. However, the vegetables inside do not get fused in the way the few extra minutes of slow cooking that the coal stove required. That reduces the joy that the Mumbai toast sandwich gave, but then the new generation will not know that as they would not have been exposed to both. I am not even getting into the fact that potatoes available abroad would be different from that in Mumbai in terms of starch levels and waxiness, the chillies and coriander there might lack the punch that they have here and that the tomatoes abroad might have more flavour than ours which seem to be becoming more tasteless by the day! Which is why I am saying that you can take the toast sandwich out of Mumbai but you cannot take Mumbai out of the Mumbai toast sandwich. Just as, without being able to buy cod locally, we cannot make the British fish and chips in Mumbai. It's fine. That's what 'eat local' is all about. Don't stress too much about! Come to Mumbai instead and join me for a toast sandwich. Here's a bit of Mumbai trivia, to the best of my knowledge, the street-side sandwiches in Churchgate and Fort cost less than the ones at Bandra. The one I had at Bandra yesterday was Rs 30. My friend, food writer and consultant Rushina Munshaw Ghildayal, has been trying to get me to eat vegetables ever since we first met which was about eight years back. She has even declared 31st March this year as Sabzi Tarkari Din. She assures me that this is not just to make me eat vegetables but is also part of her series of days to celebrate Indian food stories drawing on the entire food community. Given that the Mumbai toast sandwich is made with vegetables, I thought that I will enter this post as part of the festival. Please look out for the hashtag #SabziTarkariDin for more on this and contribute on 31st March. Rushina also does doodles that she calls Foodles. Coincidentally, she had done one on the Mumbai toast sandwich which I gifted to my brother and sister in law and it is displayed on their kitchen in Gurugram. In the foodle, Rushina reveals the secret sauce behind the 'tomato ketchup' added to the Mumbai toast sandwich. It's pumpkin or 'kaddu bhara' as the old ketchup ad on TV from the 80s pointed out. PS: My post on the first ever food blogger meet that I had attended which was in 2008 and was organised by Rushina. Tells you about how she tried to make me eat a salad there. This is one tenacious woman!